HEAT WAVE HARMS HIBBINS! TWO CATS STRANDED! LARUE CANCELS TRIP! 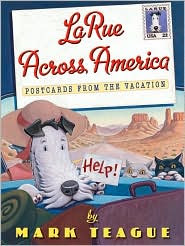 Ike LaRue, America's favorite Airedale, is back in his fourth epistolary adventure, LaRue Across America: Postcards From the Vacation (LaRue Books) ((Blue Sky Press, 2011) co-starring his long-time arch-enemies, Leona Hibbins' two feisty felines. When their mistress is taken off to the hospital with heat exhaustion, Ike's kindly owner Gertrude LaRue gladly cancels their vacation cruise, to Ike's vast disappointment, and our canine hero finds himself an unwilling passenger, sharing the backseat of their weary station wagon with two cats who obviously are enjoying Ike's discomfiture to the max. "When I tried to hold them up so that they could get a better view, they turned on me viciously"
Ike's series of postcards to Leona Hibbins grow ever more desperate as the increasingly grim Mrs. LaRue chauffeurs her pesky passengers from one scenic destination to the next across the continent. Dear Mrs. Hibbins, We were forced to stay in this vile motel, as none of the finer establishments will accept cats! Please reply promptly. As Ike acquires bandaids and other insults to his person and dignity, the incompatible tourists visit Dino-Land Theme Park, Nostril Creek, Kansas, and even the Grand Canyon, as Ike regretfully learns that the U.S. Postal Service will not accept live cats for parcel post delivery back to Snort City. At last LaRue's luck changes. Gertrude's superannuated station wagon dies in Death Valley, and the unlikely group are rescued by a true officer and gentleman, Gustave Blim, First Mate of the SS Mermaid, who gives them a lift and a complementary cruise on his own luxurious ship, where Ike and the two cats call a temporary truce over a room service fish platter. Kirkus Reviews says of this sea-to-shining-sea epistle: "This furry fiasco is fabulous fun. No pussyfooting here, just the cat's meow of a doggie's tale of woe. Bone Voyage."